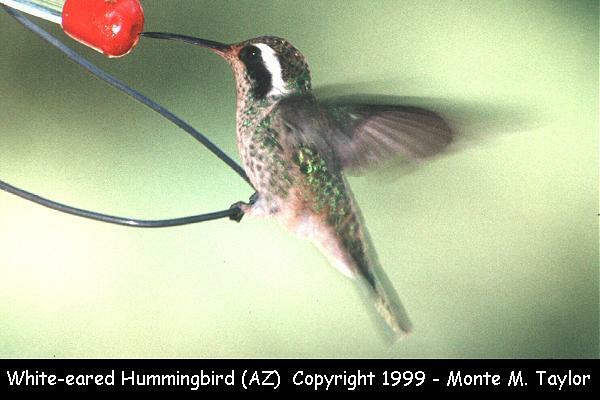 LUBBOCK, Texas -- The recent sighting of a rare hummingbird has bird biologists in Texas almost giddy. A white-eared hummingbird spotted in Lubbock earlier this month was the first to be seen in the South Plains and Panhandle regions, according to the Llano Estacado Audubon Society. Eight others have been seen in West Texas this year. Between 1972 and the end of last year, only 14 had been sighted in Texas. "This is a real explosive jump in our numbers," said Mark Klym, who coordinates the Texas Hummingbird Roundup for the Texas Parks and Wildlife Department. "Our bird biologists want to know what's going on." It could be a sign that the birds, which are known to nest in New Mexico, Mexico and southeast Arizona, are expanding their range, Klym said. "All animals tend to expand their range whenever they can," he said. Wildlife department officials want the public's help in reporting additional sightings of the bird, which has a short red bill with a black tip and a distinctive white patch of feathers on its dark head. The hummingbird, which often lives in pine-oak woods and mountain pine forests and borders, "is one that few Texans have enjoyed in their own state, and for it to be seen in such atypical habitat is fascinating," Klym said. "Any information we get about the white-eared hummingbird is a contribution to our knowledge on the bird." The annual hummingbird roundup lets Texans assist wildlife department biologists who study the bird's feeding patterns, behavior, range and their distribution. Texas has 18 species of hummingbirds, and there are about 300 species overall. Texas and Arizona, which also has 18 species, have the most of any state. About three years ago, a white-eared hummingbird was confirmed in Johnson City in central Texas, the easternmost sighting ever in the state, Klym said. The bird, a juvenile, was seen for several days in mid-June in a residential yard in Lubbock. The homeowner saw it while out gardening, Klym said. "He knew enough that it was something different and got some birders to come look at it," Klym said. Anthony Hewetson, president of the audubon society, said he saw the bird a few days after its arrival. "It was pretty awesome," he said. "A lot of people were really excited by it." Despite a lack of documentation that a white-eared hummingbird has hatched in Texas, Klym said it's his opinion that this juvenile hatched in far West Texas and flew to Lubbock. Hewetson hopes the bird's departure from Lubbock means he's winging his way home. It was in Lubbock for about five days, Klym said. "I kind of hope he made his way back to Mexico," he said.